BRAND NEW OWNERS and RENOVATIONS!!! Villa Cuatro Monos is the perfect Sayulita Mexico vacation rental for a family or group of friends looking to enjoy this small Mexican village from an exclusive yet centrally located home. Villa Cuatro Monos highlights an incredible array of skill, workmanship, and materials showcased in the perfect vacation villa environment. This 5-bedroom, 4-bath home is perfect for large families or close friends. 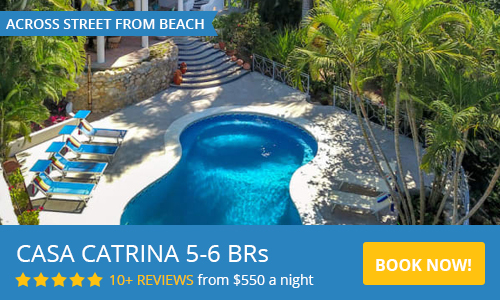 The house is located less than twenty-five steps from the main Sayulita beach in front of the surfing break, Don Pedros, and the small characteristic fishing fleet of pangas (open-bowed boats). Though a private parking space is available, a rental car is not necessary since all restaurants, shops, and village activities are within an easy walking distance from the house. A lush tropically landscaped stone walkway leads from the parking space to the enclosed private courtyard and waterfall pool. The architecturally designed estate layout includes three levels plus a separate guest house thus ensuring privacy for each of the five bedrooms. Of course, in-ground and potted tropical plants lend to a perfect jungle-ish environment. 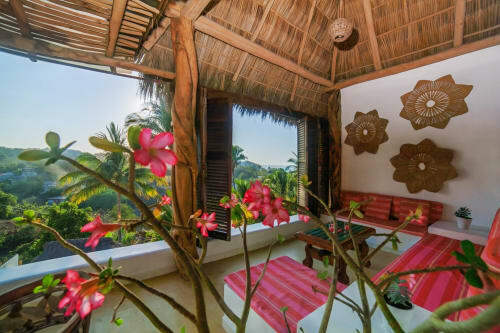 The majority of bedrooms and all living/dining areas are treated to expansive views of the Pacific Ocean, beaches, Sayulita village, and surrounding jungle. Villa Cuatro Monos comes complete with a full-time staff available for cooking meals*, provide babysitting*, house cleaning and gardening. The house also comes equiped with beach supplies to make your trip easy and fun. Private boats, surf boards and SUPS are available to rent just a few feet away. The location is amazing. Close to the beach and close to the town center. That being said, the property actually dampened the majority of the night life sounds. You’re close to the action, but if you want to have a quiet night the town won’t keep you up. Sonya, the maid, was sweet and professional and added a personal touch every time she came to visit. The property itself is immaculate and the view from the roof terrace is breathtaking. The Property manager, Estevan, is a great guy and actually came by the property to give us a few heads up while the town upgraded its water filtration system. All in all, the property, location, and staff were the perfect foundation of the already incredible vacation in Sayulita. 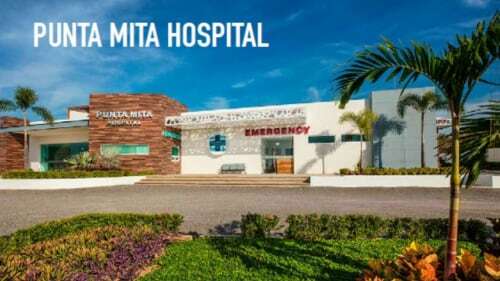 Will recommend to anyone planning a visit there. I recently returned home from staying at Villa Cuartro Monos with 8 of my friends. This house was AMAZING and the photos definitely do not do it justice. Each of the 5 rooms is a great size and come with AC which was necessary for our trip, the heat was intense! The casita was the only room I received minor complaints for...we had a crab family who took shelter in the casita for most of the trip, but hey - it's the tropics! The rooftop is breathtaking and a lot of time at night was spent up there. We caught a lightning and thunder storm on our second night, turned off the lights and enjoyed the show. The house is literally 20 feet to the beach and a very short walk to town, no need for taxis or golf carts. The location of the house was amazing, and let all of us adventure out on our own if we wanted to. Sonia was amazing. She was over every morning to clean the house and take care of dirty towels. She even came over and cooked us breakfast one day before we headed out on an ATV adventure. If we had any issues, Sonia and Cory were there to take care of us almost immediately. We did have a minor issue with the freezer and the AC at one point and both issues were resolved in a very timely and professional manner. BIG thank you to the both of them. There aren't enough great things to be said about this house and Sayulita. I am sad to be back at home but am really looking forward to my next trip to Sayulita and Villa Cuatro Monos!!! Everything was AMAZING!!!! Our group had such a great time here! We lucked out with the weather until a massive storm on our last night. Great views of the ocean from the roof, AC in every room is great, the maid was a life saver as well. Highly recommend to anyone looking to stay here with a large group. We can't wait to return to Villa Cuatro Monos! Villa Cuatro Monos in Sayulita is truly an incredible home, with breathtaking views, and the perfect location. We could not have been happier! Overall, it was first class all the way. We will definitely stay here again. We really enjoyed our time in Sayulita and the house was great. We had such fun at Villa Cuatro Monos on our Sayulita vacation. The top deck was incredible with amazing views of the surf and sunset with plenty of room for the whole crew. The house has many levels so be prepared for stairs but the upside is most rooms have their own floor, creating privacy and have an outside sitting area which we loved. The beds are a little hard, but the AC works great and each room has a fan keeping the rooms very comfortable. You walk outside to go to each room, most bathrooms, kitchen and upper deck so the overall experience is an outside vibe which is OK by me, we wanted a tropical experience. But the house is well off the street with a big coded gate to get in. Very private even though there are homes on each side. The location is hard to beat! Walk to amazing restaurants and a friendly downtown area. The beach is about a 1/2 block away so it's easy to drag the boards out to surf and your so close family can watch from the upper deck. I'd recommend this place to anyone! Our favorite Mexican vacation ever! We travel Mexico often and staying in Sayulita at Villa Cuatro Monos was by far our best experience. The property managers, Lina and Mitch were great. The property location and layout could not have been better. It is beautifully decorated in bright colors. This spacious property has 5 bedrooms, each with its own charm and very comfortable. The rooms include air conditioning, safes, and locking doors. The kitchen is spacious, open aired and well stocked with everything you could possibly need. It was a great place to congregate. The upper deck has an incredible view and has plenty of room to relax under the palapa at the comfortable seating area. It also serves as a bbq and dining area and has lounge chairs to soak up the sun. The swimming pool is well maintained and is nice and refreshing to cool off in after spending time at the beach. The managers, Lina and Mitch, were very responsive and helpful with all of our needs and questions about the area (surfing, dining, etc.). The maid service was great too. The place is very clean and fresh bath and beach towels were provided. We can't wait to return to this property and Sayulita! There are so many excellent options in Sayulita, I would not choose this house again. I offered to speak to the owners directly instead of posting a review, but Lina, the manager, wouldn’t provide their contact info nor have them call me. A few points...house keeper is horrible!!! Used dirty, wet towels entire stay. There weren’t even enough (shower and beach) for our party of 9. She is not only the rudest person we have ever met, she does nothing but text on her cell phone or sit in the laundry room with the door locked. Too many horrible details about her to list. There is nothing at the house...no beach chairs, umbrella, cooler, rafts, cards, coozies, bathroom products, tin foil etc. Beds and pillows are hard as rocks. There are no fans in the bathrooms, kitchen or common areas. So when it’s hot your only option is to be in your bedroom. This is not really a house, but more of a multi-level compound of separate bedrooms. Everything is a little run down and dirty. Every room smells like mildew. We have been coming to Sayulita for 20 years and this is the first time we have ever felt this way. There are beautiful homes with incredible staff that will not only work hard to make your stay great, but will make you feel like family. This is not the case here. No view from most areas of the house. Location is good. So sorry to hear that! Please know that we take all reviews seriously and happy to follow up on your concerns! We have been renting this home for almost 3 seasons now and guests have really loved it and we have had plenty of returns. Disappointed you had a different experience. In future stays, please ensure to talk to the staff and property manager during your stay. Most special requests and concerns can be addressed on the spot and can make for the special, custom experience that most of our guests report. As you know, all guests are in contact with the property mangers in person and via email to manage any and all requests! Cuatro Monos was very comfortable, had many terraces and one rooftop terrace with a great view of the ocean. All appliances worked, did not have any issues. We will definitely stay here again when we return. 3 night minimun during standard rate and summer rates. We are long time residents and love to be involved in the Sayulita community. We manage several rental properties here in Sayulita and look forward to welcoming you.